Hibs believe they are ahead of the game as they prepare for their long-awaited return to the Premiership with manager Neil Lennon retaining – and adding – to the core of a squad which in the past two seasons has won the Scottish Cup and the Championship title. While others in the top flight – most notably Hearts, Rangers and Aberdeen – face a summer of flux as they embark on a major rebuild ahead of the new campaign, the Easter Road club have persuaded six of those players who were about to find themselves out of contract to sign new deals. Martin Boyle became the latest to add his name to that number, penning a new two-year deal only 24 hours after the Edinburgh club pulled off what Lennon described as “a real coup” in reaching agreement with Nigerian internationalist Efe Ambrose to commit for a similar period. 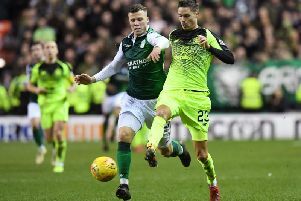 The 28-year-old, of course, is no stranger to Easter Road having spent three months on an emergency loan deal, jumping at the chance to enjoy regular first-team football again after finding himself frozen out of new Celtic manager Brendan Rodgers’ plans. But his return, allied to the news that skipper David Gray heads a list which also contains the names of Darren McGregor, Lewis Stevenson, Marvin Bartley, Liam Fontaine and Ross Laidlaw will be pulling on the green and white again gives a comforting sense of continuity, of the momentum which has been building over the course of the past two seasons continuing in what will undoubtedly be a more testing arena. Hopes remain high that negotiations to bring Israeli internationalist goalkeeper Ofir Marciano back following a successful season on loan from Ashdod to whom he remains contracted for another season can be successfully concluded, adding another tinge of familiarity and underling yet again the faith Lennon has in the squad he inherited last summer. In fact, all players about to go out of contract were offered new deals but there have, of course, been departures, a natural occurrence at the end of any season, striker James Keatings understandably deciding he would have a better chance of more game time at Dundee United while veteran hitman Grant Holt and winger Alex Harris, having failed to nail down a regular first-team place, also headed for the exit door as did Chris Humphrey and Brian McLean as their short-terms deals expired, and Andrew Shinnie as his season on loan from Birmingham City came to an end. Fraser Fyvie, too, is highly unlikely to return but with the likes of Paul Hanlon, John McGinn, Jason Cummings, Dylan McGeouch and Jordon Forster still tied to the club and youngsters Scott Martin, Oli Shaw and Ryan Porteous all set to play a part, it’s obvious there will be little or no need for Lennon and his assistant Garry Parker to spend much time on a “getting to know you” exercise when the squad report back to East Mains for pre-season training on June 22. Former St Johnstone midfielder Danny Swanson and ex-Dundee United striker Simon Murray will, presumably, be joined by an as yet unspecified number of new arrivals but given Lennon has been able to indulge more in a bit of tinkering rather than wholesale changes, assimilating such players into the squad should prove somewhat seamless. It’s very much in contrast to Capital rivals Hearts where nine new faces arrived during the January transfer window but now only three remain while Jambos boss Ian Cathro will also have to contend with the probable departures of Callum Paterson and Sam Nicholson, while the future of last season’s top scorer Jamie Walker is also in serious doubt. He has, though, made a start to reshaping his squad with the return of Scotland defender Christophe Berra and the signing of Tranmere Rovers striker Cole Stockton. At Ibrox it’s very much a similar case, new boss Pedro Caixinha taking the axe to the squad he inherited from his predecessor Mark Warburton, the early moves in his revamp seeing Portuguese international defender Bruno Alves arrive in Govan quickly followed by Aberdeen’s Ryan Jack as he exercised his right to move on from Pittodrie, while Mexican winger Carlos Pena is also expected to touch down in Glasgow. Jack was one of four Dons players to announce they’d be leaving the Granite City, first-team regulars Ash Taylor, Niall McGinn and Peter Pawlett the others along with goalkeeper Neil Alexander, presenting manager Derek McInnes with a number of formidable holes to fill. While he’ll be delighted at getting so much work done early, Lennon will, however, be conscious of the fact that both Scotland midfielder McGinn and Cummings, Hibs’ top scorer in each of the past three seasons, have naturally attracted much attention and although offers – as unwelcome as they would be – have yet to be made, he’s also conceded that, as always, every player has his price. Having said that, should anything happen it will be on Hibs’ terms, a £1.7 million bid from Peterborough United for Cummings rejected this time last year with the value of the forward and that of his team-mate having undoubtedly increased in the meantime. As such, Lennon can feel entitled to be confident about the new season, reflected in the fact 10,900 season tickets sold with the prediction being sales will hit record levels before a ball is kicked in anger.